Don't be fooled by the term "freeware" when it comes to the u-he TyrellN6. It is a full fledged soft synth designed at the behest of Amazona.de, a German Online Magazine. However, it soon became obvious that developing the hardware would have taken years, so I (Urs) offered to turn the core design into a freeware softsynth. That was late 2010. Only a few weeks later, TyrellN6 was out for beta testing! After some serious bug-fixing and fine tuning, the final release version became available in April 2011. " 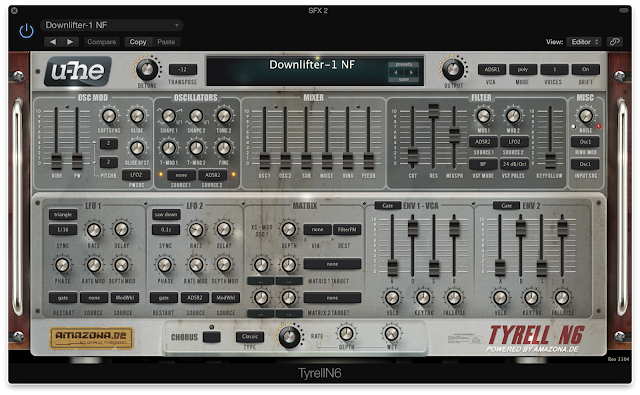 I downloaded and tried the TyrellN6 on a project and was impressed with the quality and quantity of infinitely tweakable patches that are included. Make sure to check out the other excellent products offered on u-he's website.